The Greylag goose is well known to many. It has increased in number and expanded its breeding areas, and is found both along the coast and in moorlands. In addition, it is a bird easy to hear as it has a loud cackling call and easy to see as it flies in characteristic flock formations on the move. It is a big and powerful bird. The feathers are light gray, and the beak is orange/pink while the legs are pinkish. This can help to distinguish it from other goose species that occur here. 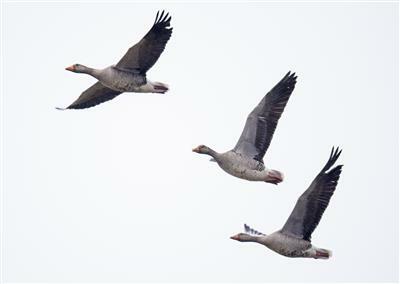 Most of the Greylag Goose breeding in Norway overwinter in Western Europe. A few may also spend the winter in Norway, although most of them are staying here from March to October. This graph shows the number of observations distributed by years. The yellow line is the average for all years. Note that the observations for 2018 will be completed in November.